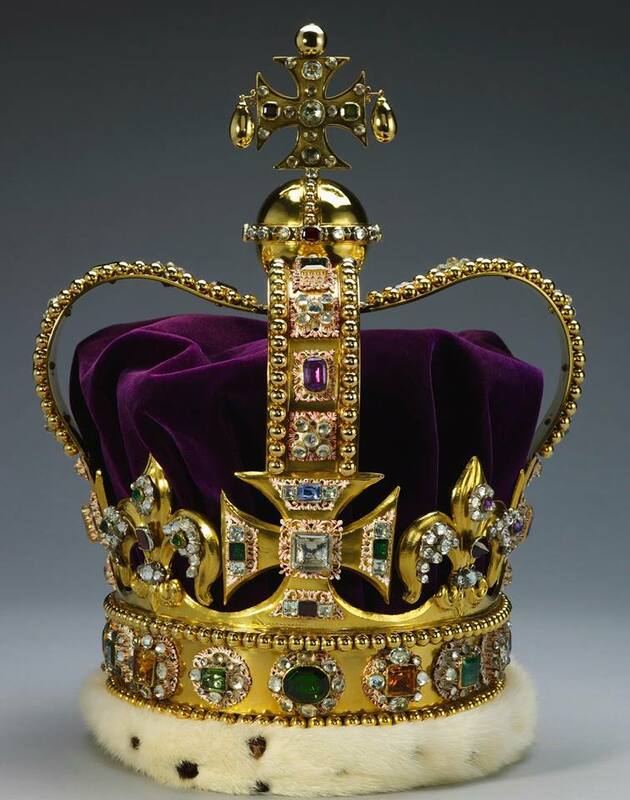 Last month I posted the Crown Jewels of England (Part One) that featured interesting information about the royal regalia that is used during the coronation ceremony of the British Monarch. 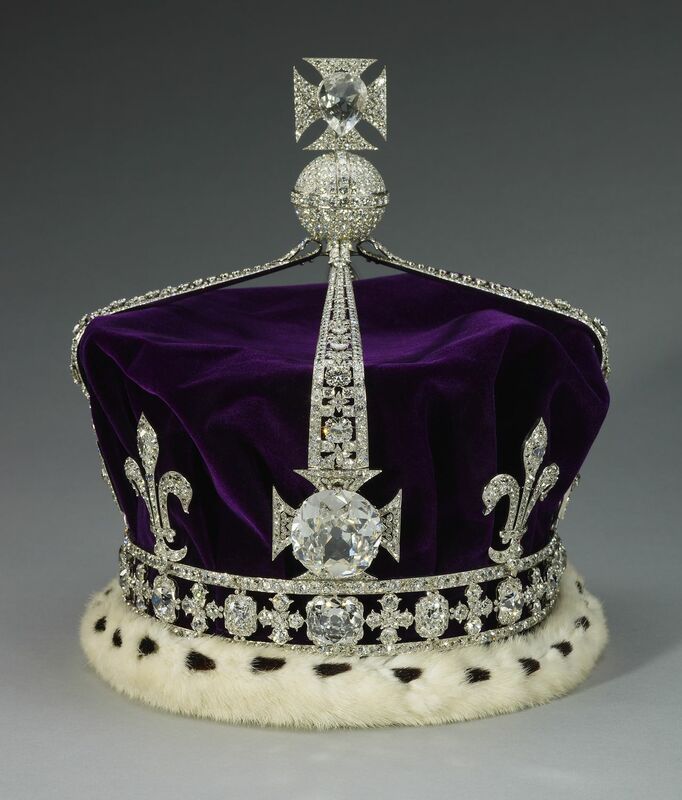 Today’s post will have detailed information about a few of the other items in the royal collection, such as the Imperial State Crown, the Imperial Crown of India, the Queen Victoria’s small diamond crown and the Crown of Queen Elizabeth, the Queen Mother. 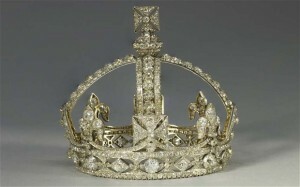 One of the most famous crowns in the royal collection is the Imperial State Crown. The original crown was made for Queen Victoria in 1838, but when the crown became un-repairable an exact copy was made in 1937 for the coronation of King George VI. Then in 1953, the crown was altered to fit the smaller head of Queen Elizabeth II. The Imperial State Crown is made with a gold frame with four crosses, four fleurs-de-lis and two crossing arches that were lowered by about one inch to give the crown a more feminine appearance for Queen Elizabeth. At the top of the arches is a cross pattee and the crown includes 2,868 diamonds, 272 pearls, 17 sapphires, 11 emeralds and 5 rubies. Several of the stones are historically famous; such as two of the four dangling pearls were once worn by Queen Elizabeth I, in addition there is the Black Prince’s Ruby, St. Edward’s Sapphire and the Stuart Sapphire. The most famous gemstone in the Imperial State Crown is known as the Second Star of Africa which is the second largest stone cut from the world renowned Cullinan Diamond. The Imperial State Crown is traditionally worn during the recessional of the Coronation ceremony when the monarch leaves Westminster Abbey. The Crown is also worn by the monarch for the annual State Opening of Parliament. Traditionally, the crown and other royal jewels worn for the occasion are transported to the Robing Room within the Parliament building and this is where the Crown, jewelry and royal robes are put on before the ceremony begins. The Imperial Crown of India was created for George V as the Emperor of India to wear at the Delphi Durbar in 1911. In theory, when the monarch is crowned during the coronation ceremony in Westminster Abbey in London he becomes king or queen of England and all the Commonwealth countries. But King George was advised by his ministers that his presence was need in India after the coronation and the Durbar was arranged but due to the tradition that the Crown Jewels are never to leave the United Kingdom this new crown was specially made for the occasion. Due to the heavy weight the Imperial Crown of India was never worn again. 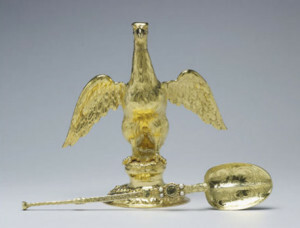 The crown has a silver frame laminated in gold and set with 6,100 diamonds. The band is set with larger diamonds, emeralds and sapphires surrounded by more diamonds. Above the band are four cross pattee set with rubies and four fleur-de-lis with emeralds surrounded with even more diamonds. 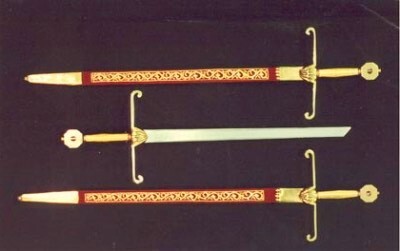 The eight half-arches are topped with a cross pattee with an emerald in the center, most British royal crowns traditionally have only four arches. Following the death of Prince Albert in 1861, Queen Victoria left London for the seclusion of her other homes and withdrew from any public engagements. Out of respect for her beloved husband, she wore mourning clothes for the rest of her life. Deciding that her elaborate jewels were not appropriate for her status as a widow, she had a smaller diamond crown made that was more suitable and usually wore it over a veil of Honiton lace. 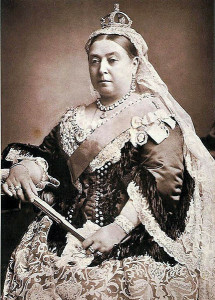 This is the image of the older Queen Victoria that is depicted in portraits, sculptures, photographs, coins and currency in the last decades of her reign. The small crown, less than 4 inches in diameter was made in 1870, has a silver frame laminated in gold and wet with 1,187 diamonds. When Queen Victoria died in 1901, the crown was placed on her coffin as it traveled from Osborne House to the state funeral in London. Subsequently, the crown was worn by Queen Alexandra who later gave it to Queen Mary. 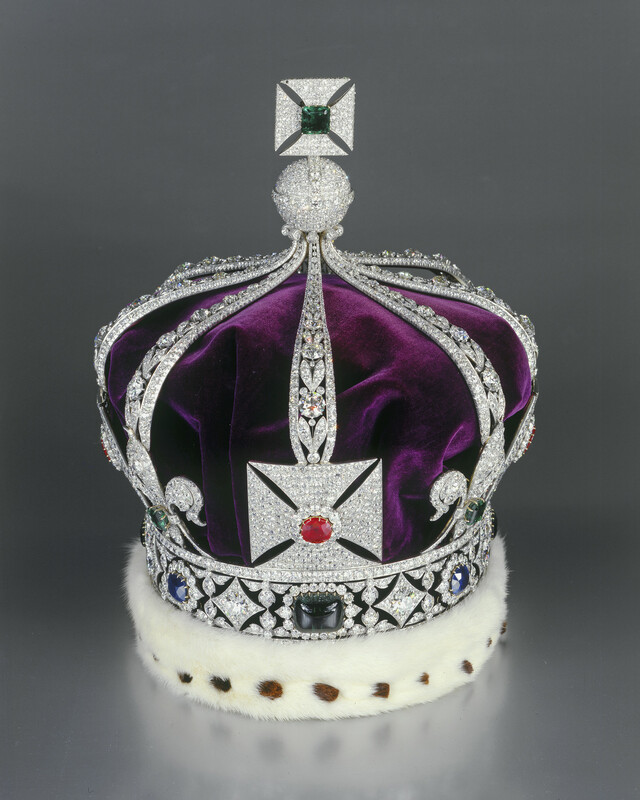 In 1937, King George suggested that the crown should be added permanently to the display of Crown Jewels at the Tower of London and it has not been worn seen that time. 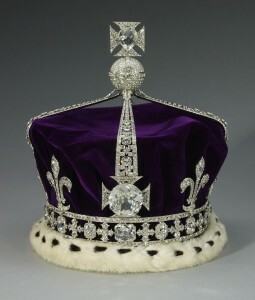 For the coronation of King George VI in 1937, a special crown was made for the Queen Consort. The crown is made of platinum with a band set with diamonds with four alternating cross pattee and fluer-de-lis of four each and features four arches that are detachable which allows it to be worn as a circlet. This is how it was worn by the Queen Elizabeth for the State Openings of Parliament during the reign of George VI and also how it was worn in 1953 for the coronation of her daughter, Queen Elizabeth II. 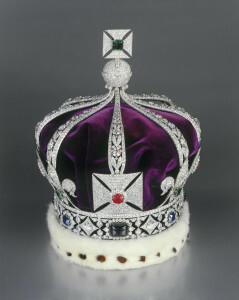 The crown is set with 2800 diamonds; the most notable one is the 105 carat Koh-I-Nor diamond displayed in the middle of the front cross. The diamond was given to Queen Victoria in 1877 when she became Empress of India. 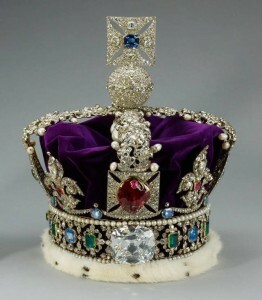 The crown also contains the almost 23 carat Lahore Diamond which was given to Queen Victoria by the East India Company in 1851 and a 17 carat diamond that was also given to Queen Victoria by the Sultan of the Ottoman Empire in 1856. 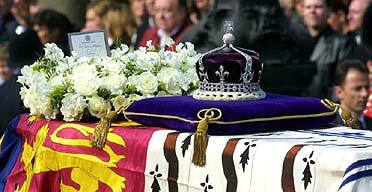 In 2002 when Queen Elizabeth, the Queen Mother died at the age of 101 the crown was set on her coffin during her state funeral. 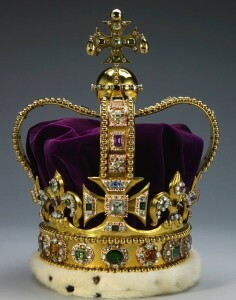 The crown is now displayed with the Crown Jewels in the Tower of London. 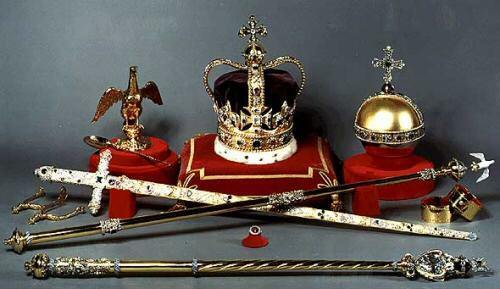 For more information about additional items in the royal collection, please check out last month’s post, The Crown Jewels of England (Part One). 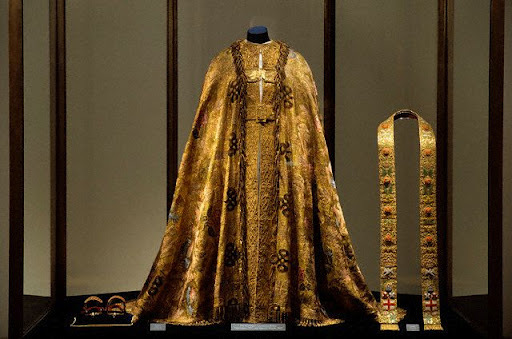 In this post there is detailed information about the royal regalia used for the coronation ceremony of the English kings and queens since 1660. Also, if you are interested in more information about the Royal Family and their jewels, please click on the links to the following posts: The Queen’s Jewelry Collection (Part One and Part Two) and the Cambridge Emeralds.